Perhaps I am just not fashion forward enough because this is just not stylish to my eyes. I must be missing the point. This bag is supposed to invoke the idea of romantic sea, but how? Is it the cotton cord? 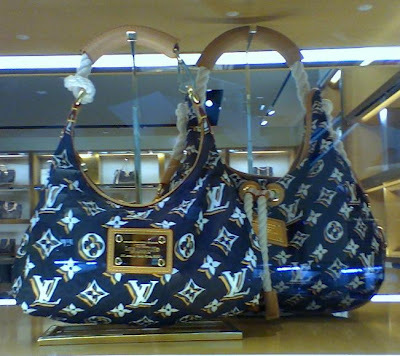 I know it's a Louis Vuitton but I seriously have an issue spending $1170 for the PM size (small in front) and $2330 for the GM size (large drawstring in back), especial when it is made of nylon. Well, I think I have less of an issue with the material. Rather it is the print that totally turns me off the bag. For $2330 I can almost buy a classic Chanel. This just proves most expensive is not necessarily the best. What do you think, savvy or not? They look great, but I'll never spend big money for one of them. The LV Bulls MM looks (and feels) great! The ropes give such a nautical feeling, each detail is meticulously done and the whole bag evokes the feeling of easiness, utmost elegance and luxury. Nylon? Yuck!! No, I don't think that they are worth that at all! I agree plus the blue color is not my thing! euf, i agree with you. whole-heartedly. definitely not a fan in the least. I dont think they are worth it too. This LV is not just for me. I have a problem spending so much money on something that I know I wouldn't use often enough, even if it's an LV. I don't like the logo being all over the place too. Ugh, I've never loved the LV mono that much and it looks glaringly showy here. Seriously that $ is better spent on Chanel! Not savvy at all. I'm not liking this look. The shape isn't nice. Plus, I bet a lot of fake versions will pop up. Lovely blue color but I'm not a fan of the bag, so tired of that always the same boring LV sign.. I don't like it at all... Hahaha! I hate big logos and the Bulle bag is screaming logo. The oversized logo print is too distracting and kind of vulgar. I'd rather have a classic LV! I don't like it...Chanel is better!! I like these bags...well, except for the handle. I'm not into the rope look. i just saw those in the store and was really turned off by the rope thing. Love the pictures, they're great! I like them, but that is just way too much money to spend. I can't see forking over that much. I'm not a fan of them either. Like you, I would rather have a Chanel. I'm gonna have to agree with you here. I'm not feeling the price tag. Oh I don't know . It's like a cheap bag , I don't know why . And I agreed , Chanel is so much better . Everyone can see the big difference I guess . so cute but so expensive!!! LOL. I'd have to agree with you, those bags are not romantic at all. Collection people, collection! Wait until you held one, it's fun, elegance, feel good in and out (of you). It's all relative, it's all about how one views it. I am sure, all of you above, when you DO have that kind of money to spend, you would have gotten one too...be real! I am sure everyone has different opinion of what is reasonable and what is not. What is fun and stylish to one person is not to another. There are def. pieces regardless of the price and, may not be stylish in the eye of the beholder as we all have different taste.